I've been doing a lot of walking and bike riding around Four Corners in the past two weeks since my summer break started. I've walked down all of the sidewalks along the major roads, and I noticed some common themes. First of all, most of the sidewalks are way too narrow and close to the road, which is nothing new, but that's a topic for another post. The thing that annoys me is the way that the existing sidewalks are treated. Sidewalks are too frequently viewed as an afterthought. As I've walked along Colesville Road and University Boulevard, I've seen all sorts of things blocking or obstructing the sidewalks. Examples include: trashcans, utility poles, parked cars, road signs, and overgrown vegetation. When I see a particularly egregious obstruction, I take a photo of it. Here are three of the worst offenders. Stay focused when using this sidewalk so you don't walk into this Ford Focus. This Ford Focus was parked on the sidewalk in front of the Oceanic gas station on University Boulevard at Sutherland Road. The car doesn't have any rear plates on it, which means it was likely undergoing repairs at "Joe's Auto Repair" which is the name of the gas station's garage. This car was probably placed here by one of the mechanics who works at the shop. As you can see in the photo, there is a utility pole and some shrubs to the right of the vehicle, preventing someone from walking by it on the safer side. This means that anyone walking past it must pass it on the left, in that narrow space between the vehicle and the right lane of University Boulevard. After taking this photo, I did just that, walking between the car and the road as a tractor trailer passed by in the right lane. I was close enough to reach out and touch the trailer of the passing truck. Parking a car on the sidewalk like this is unacceptable. The mechanic probably put it here because there was not enough room on the station's property to fit all the cars they are repairing. If that that is the case, then they should not have agreed to repair more vehicles than they could accommodate on their property. If this vehicle had been causally parked in the travel lanes of University Boulevard, it would have been ticketed, towed, and impounded within half an hour. But it was on the sidewalk, and it remained in this spot for several days without consequence. Before most of the subdivisions around Four Corners were built, the intersection of U.S. Route 29 (Colesville Road) and today's MD Route 193 (then Bladensburg Road) was just a rural crossroads. Intersections such as these, if devoid of other commercial activity, are usually home to one thing: gas stations. Four Corners was no different. Gas stations were some of the first commercial establishments to open at the intersection. The oldest station, dating to the 1930's, was located right in front of the Woodmoor Shopping Center. It was originally called the Woodmoor Esso. The Four Corners intersection in 1952. The Esso can be seen at center in front of the shopping center. This was a decade before the roads were widened. Notice the gas stations on the southeast (next to the church) and northwest (next to the other shopping center) corners of the intersection. Last night, the civic associations of Woodmoor, South Four Corners, and Northwood-Four Corners hosted a candidates forum for those running for the Montgomery County Council District 5 seat. The event was held in the auditorium of Pine Crest Elementary School in Woodmoor. All five candidates were present for the lively forum: Terrill North, Evan Glass, Tom Hucker, Chris Barclay, and Jeffery Thames. The event was well attended; I was at the forum, and I estimate that there were between 75-100 people in there. The line of questions at the forum can be roughly broken down into the following categories: governance, transportation, and development. The candidates on stage in the Pine Crest multi-purpose room. Photo by the author. I attended the event with my father (a 24 year Woodmoor homeowner), and we arrived around 6:50, 10 minutes before the scheduled start. The front of Pine Crest looked much like it does on election day: dozens of campaign signs everywhere, cars in the lot with political bumper stickers, and people handing out literature at the door. Inside, some of the candidates were already mingling with attendees as members of the homeowners associations finished setting up. I spoke briefly with candidates Chris Barclay and Evan Glass before the event got started. As the late arriving crowd continued to trickle in, the forum got underway at 7:10. The format was as follows. 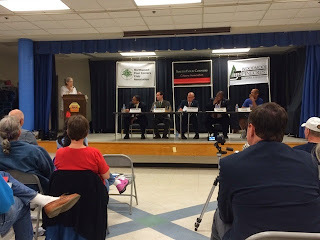 The forum was moderated by Carol Barth of the Northwood-Four Corners Civic Association (NFCCA). The candidates were asked two types of questions. One type was called the lighting round: Each candidate was given four signs that said "Yes", "No", "Maybe", and "Don't Know", and they all had to hold up their answers together when the question was asked. The second type of question was timed: Candidates were given a question, and they each had between 1 and 2 minutes to answer it, depending on the question (time limit was chosen by moderator). Almost all of the questions were pre-selected by the civic associations. The audience members only had a chance to ask questions if they had written them on a card and passed it up to the moderator via other civic association members. There was no town hall style "open forum" where attendees could raise their hands and ask questions directly to the candidates. However, there was ample time before and after for attendees to ask the candidates questions individually during the mingling sessions. Here's how each candidate responded to the various questions in general terms. These are not meant to be quotes, instead, they are the theme of the candidates message as they answered each question. I'll try to be as neutral as possible in my descriptions based on my notes, and I will try to focus on things each candidate said that differed from the others (they agreed on many things like community engagement, accountability, etc. so it would be repetitive to state things like that over and over).